This cartoon adventure is based on Twentieth Century Fox's animated movie Once Upon a Forest. Though the movie flopped in its theatrical release, the ecological message in the story has appealed to many who later saw it on video release. The game is more than a movie, it's an adventure game brought to life with exciting animation, sound effects and music. And your child is the star. Will the trio of furlings win a race against time to save their sick friend? 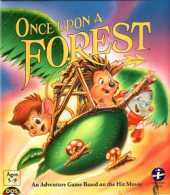 It's up to the kids who play Once Upon a Forest as they join Abigail, Russell and Edgar on a rousing journey through Dapplewood forest.